The IS-IS config is below. By default a router with a Level2 link will advertise a default route to routers it has a Level1-only adjacency to (e.g. LS2 advertises a default route to LS1, LS3 advertises a default route to LS4). LS2 and LS3 are using an export policy to only advertise loopback prefixes to all neighbours. LS2 will advertise it's own loopback and LS1 loopback IPs to LS3. LS3 will advertise it's own loopback and LS4 loopback IPs to LS2. LS2 however, is only advertising it's own IP to LS1, the other loopback IPs it knows about (LS3 and LS4) are outside of the local area (0001). 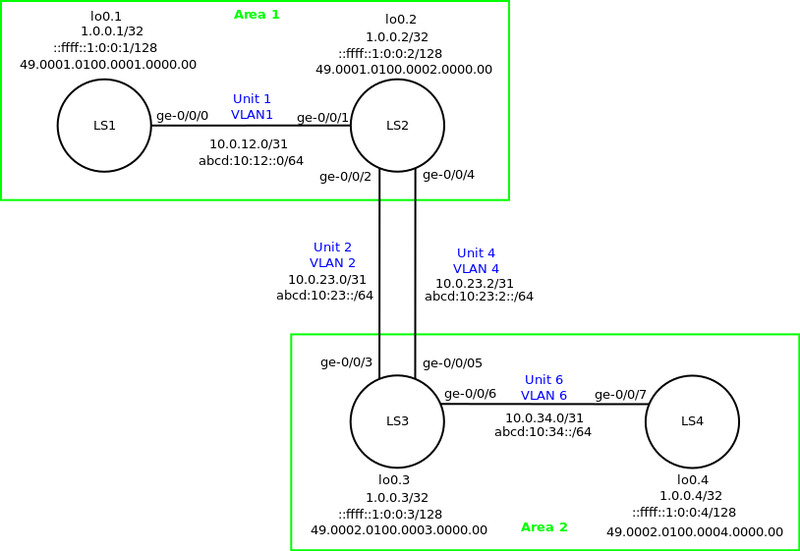 LS1 uses the default route from LS2 to reach these IPs. set logical-systems LS1 interfaces ge-0/0/0 unit 1 family iso # Enabled IS-IS at the data plan. set logical-systems LS1 interfaces lo0 unit 1 family iso address 49.0001.0100.0001.0000.00 # At least one NET address is required on any interface, Loopback preferred. set logical-systems LS1 protocols isis traceoptions flag all        # of log entires. set logical-systems LS1 protocols isis reference-bandwidth 1000g  # 1Tbps is the highest supported. set logical-systems LS1 protocols isis topologies ipv6-unicast   # IPv6 Unicast must be explicitly enabled, IPv4 Unicast is enabled by default. set logical-systems LS1 protocols isis overload timeout 120   # No "wait-for-bgp" like Cisco, so tweak as required. set logical-systems LS1 protocols isis overload advertise-high-metrics # Link as still available during a failure of primary path. set logical-systems LS1 protocols isis level 1 authentication-key "$9$M3F8xds2aZUHYg"
set logical-systems LS1 protocols isis interface ge-0/0/0.1 hello-padding strict   # Highest overhead, useful if using 3rd party layer 2 links. set logical-systems LS1 protocols isis interface ge-0/0/0.1 point-to-point   # Disable LAN IIH PDUs and use p-t-p IIH PDUs instead. # set logical-systems LS1 protocols isis interface ge-0/0/0.1 checksum # Checksum can't be used on the same interface as MD5 authentication. set logical-systems LS1 protocols isis interface lo0.1    # Enable the interface with the NET address, loopbacks automatically enter passive mode. set logical-systems LS2 protocols isis export IS-IS-Loopbacks-Only  # Filter prefix advertisements to loopbacks only. set logical-systems LS2 protocols isis level 2 authentication-key "$9$xuWNVYoJDikPaZ"
set logical-systems LS2 protocols isis level 1 wide-metrics-only                        # the default mode is mixed Level1/2 router. set logical-systems LS2 protocols isis interface ge-0/0/2.2 level 1 disable   # Backbone links become Level2 only. set logical-systems LS3 protocols isis level 1 authentication-key "$9$77-b2aZjHqfJG"
set logical-systems LS3 protocols isis level 2 authentication-key "$9$7X-b2aZjHqfJG"
set logical-systems LS4 protocols isis level 1 authentication-key "$9$ExbcrvLxdbs4X7"